A bilingual picture book for children about the joy of accomplishments and talents. Miranda lives to dance. Hers is a world filled with dizzying pirouettes and graceful flying leaps, all to the rhythm dictated by her very own heart. Miranda eagerly prepares for the day of her recital and her first stage appearance, a day on which she is sure to shine. But on the day of the recital, Miranda accidentally learns about her mother’s debilitating childhood illness that prevented her from dancing as a child. Suddenly Miranda’s limbs feel leaden, and she’s completely lost her sense of flight. When Miranda sees the world through her mother’s eyes, she feels trapped within the confines of her own body. Can Miranda rediscover her whirl and twirl? 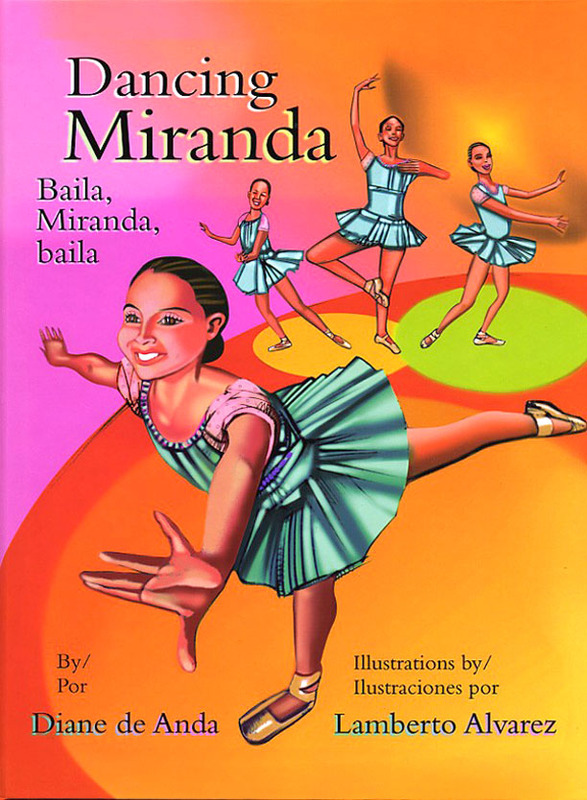 Complemented by kinetic images, the story of Dancing Miranda urges young readers aged 3 to 7 to appreciate their gifts and look past the physical limitations that threaten a soaring spirit. Instead, they may find that their efforts give a little joy to those who have lost their own. DIANE DE ANDA, a professor in the department of Social Welfare at UCLA, is the author of two collections of short fiction for young readers, The Ice Dove and Other Stories and The Immortal Rooster and Other Stories. Her stories and poems have been published in a number of journals and magazines. She is also the author of numerous articles and books including Controversial Issues in Multiculturalism and Project Peace. LAMBERTO ALVAREZ heads Solare Design Group, Inc., an illustration, photography, and design firm based in Fort Worth, Texas, where he lives with his wife and two children. He also serves as Director of Illustration for The Dallas Morning News in Dallas.